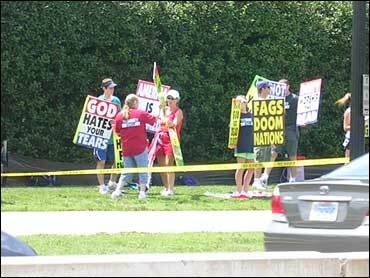 The Topeka, Kan.-based Westboro Baptist Church (WBC), which is not affiliated with any national Baptist organization, announced plans to protest at victims' funerals only hours after 32 people were killed in the worst mass shooting in U.S. history. They also may protest at other events on the Virginia Tech campus. The organization, founded and led by Fred Phelps, believes the United States has condemned itself to destruction by accepting homosexuality and other "sins of the flesh." Phelps' daughter, Shirley Phelps-Roper, said the Virginia Tech teachers and students who died on Monday brought their fate upon themselves by not being true Christians. "The evidence is they were not Christian. God does not do that to his servants," Phelps-Roper said. "You don't need to look any further for evidence those people are in hell." Cho Seung-Hui, the Virginia Tech student responsible for the killings who took his own life after the shootings, was sent by God to punish those he killed, and America as a whole, for moral decline, said Phelps-Roper, while adding that she believes Cho is also in hell for violating God's commandment to not kill. "He is in hell," Phelps-Roper said. "But he was also fulfilling the word of God." Because of its virulent anti-gay message and condemnation of Catholics, Jews and other groups, the WBC has been classified as a hate group by the Southern Poverty Law Center and is monitored by the Anti-Defamation League. Curtis Dahn, the president of Virginia Tech's Lesbian, Gay, Bisexual and Transgender Alliance, said he reacted with immediate disgust upon hearing of the WBC's plans. "Thirty-three people are dead and they're using people's deaths and people's grief to further their own agenda and it's just disgusting," he said. Dahn was friends with Ryan Clark, a resident assistant in Ambler Johnston Hall, who was among the first people killed on Monday. He said he is working with other university leaders and officials to form a response to the WBC. Ideally, he said, the funerals will be nothing more than a chance for family and friends to mourn in peace. "Part of it is that I don't want the families to be affected by this at all," he said. "I don't even want the funerals' locations to be public knowledge. I don't want a protest, I don't want a counter-protest. I want people to be able to grieve and have what they want, not be made into public displays and mockeries." Dahn and others may have the law on their side. In 2006, in response to protests at the funerals of dead U.S. soldiers, Virginia enacted a law that added funerals and memorial services to the state's disorderly conduct statute. Other states have adopted similar measures to allow police to keep WBC protesters out of earshot.